While preparing my regular recipe for our local paper The Gisborne Herald, I went into the local shops I frequent to make sure all the ingredients were still available. A while ago I had purchased a large bottle of Giffard Strawberry Syrup and had plans to add the Peach Syrup to my pantry. However, as it often goes, products come and products go. And the Giffard range of syrups has disappeared from our local stockist which upset my muesli plans. So what to do….. I had a search all around our fair city for another Strawberry syrup that would suffice. Other than the Barkers Fruit Syrups (in particular the Squeezed Rhubarb with Raspberry & Rosehip, which isn’t Strawberry but is a red berry fruit so was a good option in my mind), or Baker Halls & Co Fruit Syrups (I have used the Apple & Pomegranate in my homemade muesli), the next best option was the Raspberry & Boysenberry Compote from The Dollop Kitchen. It must be fairly popular compote as the shelf was empty. Other ideas were to buy strawberry jam and heat it until liquid (I often use jam in my muesli as it is a great way to use up jam flavours that the kids haven’t appreciated); use a icecream topping such as Delmaine Strawberry Topping or try to track down some Milkshake Syrup (such as Supreme or Six Barrel Soda Co. – the later requiring a trip to Napier or Havelock North). I could order online but I needed it, like, yesterday and I also wanted something available locally. On another note, the Raspberry & Lemon or Cherry & Pomegranate from Six Barrel Soda Co. both sound really good, maybe I’ll order some anyway). The only other option was to make some strawberry syrup. 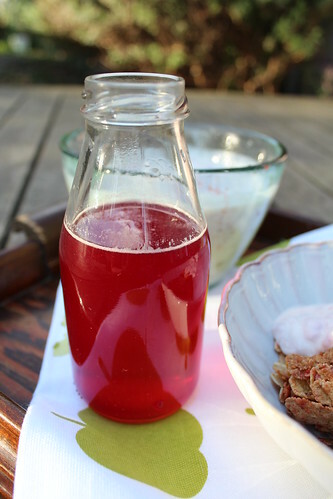 I make fruit syrups regularly as they are easy and use three ingredients: fruit, sugar, water. 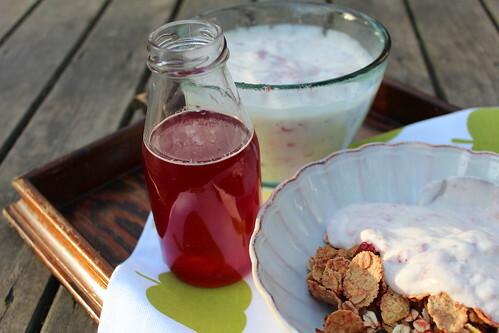 So here is my strawberry syrup recipe (the muesli recipe is coming in the next few posts). I have used frozen strawberries as NZ-grown frozen strawberries were preferable to tasteless imported fresh strawberries. This coming summer I will make sure I freeze plenty of strawberries so I can whip up this syrup. I thought about adding a vanilla pod, or some black pepper. Both are well suited to strawberries but I decided in this instance to stay with simple strawberry. It doesn’t get much better than that. Place all the ingredients into a medium-sized saucepan. Bring the ingredients to a boil then turn down and simmer until the fruit is soft and pulpy (about 25-30 minutes). Strain the mixture through a sieve or jelly bag. Pour the syrup into a bottle and store in the fridge once cooled. Use to make muesli or add to cold milk for a strawberry milkshake. It is also delicious poured over ice-cream. Mash the leftover strawberry pulp and add to 2 cups of unsweetened natural yoghurt or add them to a smoothie. 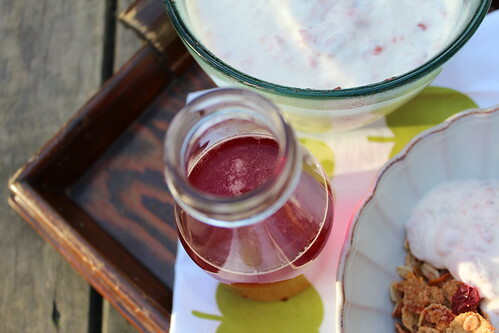 The syrup can be used in many ways – not just in muesli. Put a tablespoon in a glass and top up with cold milk for a strawberry milk drink, or add some vanilla icecream and use the blender to make a strawberry milk shake. 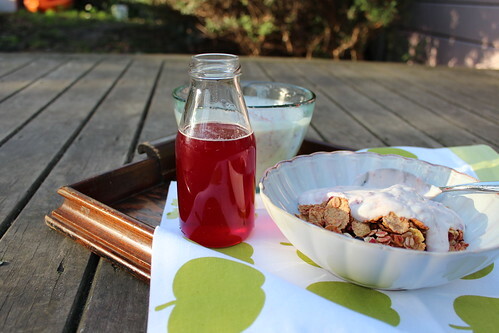 We use it to flavour our natural unsweetened yoghurt and serve with muesli for breakfast. It is also nice with vanilla ice-cream.